Avoid giving equitable interest with your rent to own contracts. Ok, so what is equitable interest and how does it affect your lease to own agreements? Simply put, if you use a generic rent to own contract and end up having to evict the tenants living in your home, the judge could misunderstand your simple contract. If the judge thinks the tenant has “equitable interest” in your home, you will then have to foreclose on the tenants instead of evicting them! You definitely want to avoid, especially in today’s market where it could take 12+ months to foreclose. An actual lease option isn’t a sale at all. You will want to be signing TWO separate agreements. The standard lease: This is just like the rental agreement you would use when renting your home. Option agreement: The option agreement gives the tenant the option and right to purchase the property during the lease option term, at the agreed upon price. When completed properly, if the tenant defaults on the lease agreement and you are forced to evict them, you would be doing a normal eviction like you would with a traditional rental home. 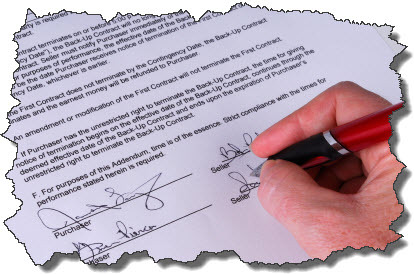 Sellers usually get into trouble when they use documents that have similar language to an agreement for deed, also known as a land contract, contract for deed, or installment land contract. This IS a type of sale. This was extremely helpful to me. Thanks for making key points simple and easy to apply. In you second sentence, the word “effect” should be “affect” —- I’m not a lawyer, but even I know your knowledge of the English language is deficient, so why should I believe your legal advice??? Jim, thanks for pointing that out! Also, I’m glad you asked this question. The intention of this article is to provide awareness about potential issues when using rent to own contracts, references to related information and resources that can hopefully help you with your research. We are not offering legal advice whatsoever and even recommend reading everything online with a bit of skepticism. I hope that answer helps! Please let us know if you have any questions or other suggestions to improve the site. Best of luck!